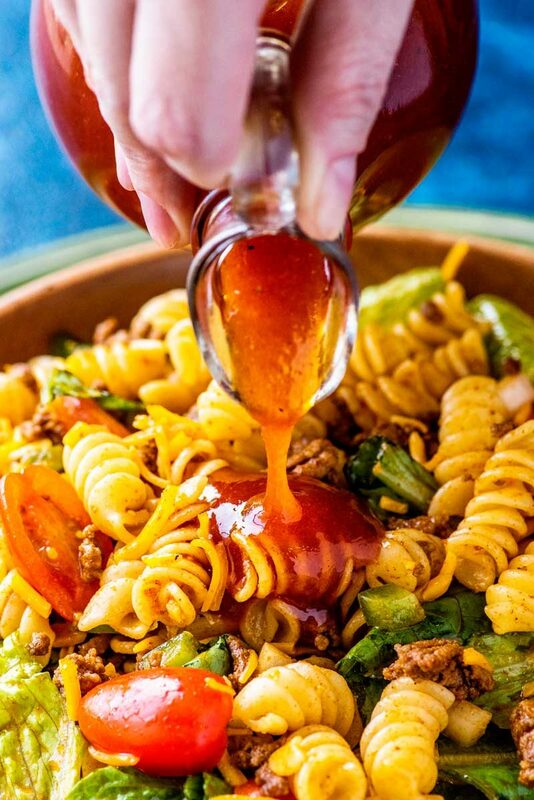 Traditional taco pasta salad made with spiral pasta, ground beef, sweet tomatoes, veggies, plenty of cheese, and topped with sweet Catalina dressing. Classics are classic for a reason, and this fan-favorite recipe proves it! 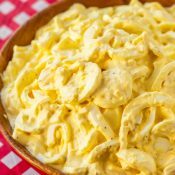 Whether you’re planning a summer BBQ or are just in need a simple side dish, taco pasta salad is always a solid choice. Between the tender pasta, fresh veggies, and the melody of flavors, it’s a great dish to have in your recipe arsenal not only because it’s easy, but because everyone always loves it. I get compliments every time I make this, and what better endorsement is that? And because it’s so good, I’ve lost track of how many times I’ve made this pasta salad as a last-minute offering for a house party. I’ve even whipped it up as an easy lunch to help get me through the week. This recipe is a classic, and it’s classic because it’s so good. 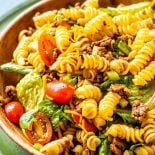 What’s in taco pasta salad? 1 – Spiral pasta. 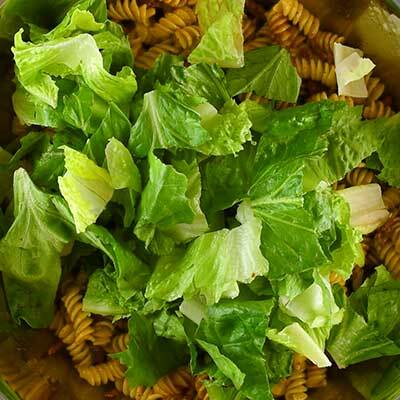 You can always use any pasta that you like, but this pasta salad is best with spiral pasta. 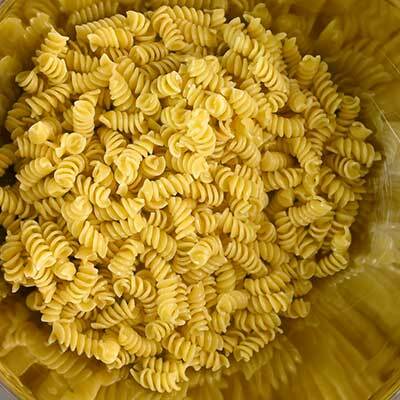 I like to go with rotini pasta since it’s easy to find and made by most popular brands. 2 – Ground beef. 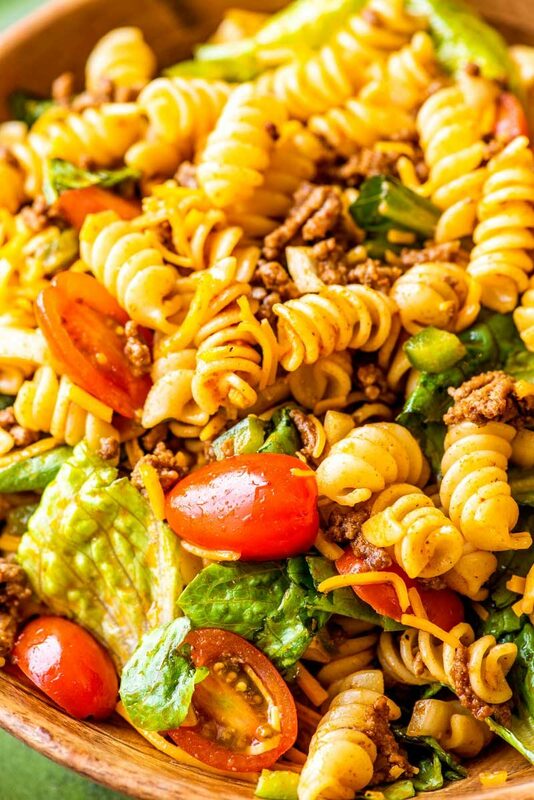 Just like a classic taco, this pasta dish is made with ground beef. 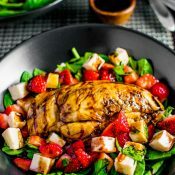 However, you could easily substitute this for another ground meat, or even use cooked chicken or shrimp. 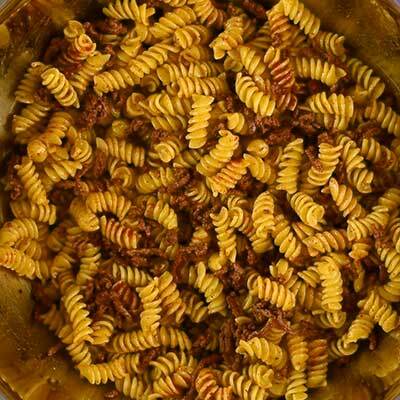 Essentially any meat that goes well with taco seasoning will work well in this pasta. 3 – Taco seasoning. This just wouldn’t be a taco pasta salad without a little taco seasoning. You can either use storebought seasoning or make your own. 4 – Veggies. 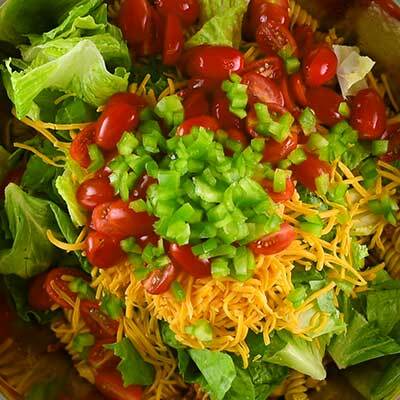 No taco is complete without a round of fresh veggies, particularly leafy lettuce and red tomatoes. 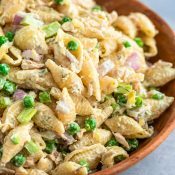 Both are present in this pasta salad, as well as chopped yellow onion and green pepper. 5 – Cheese. You can use any cheese you like, but I’ve found classic cheddar cheese to work the best. 6 – Catalina Dressing. 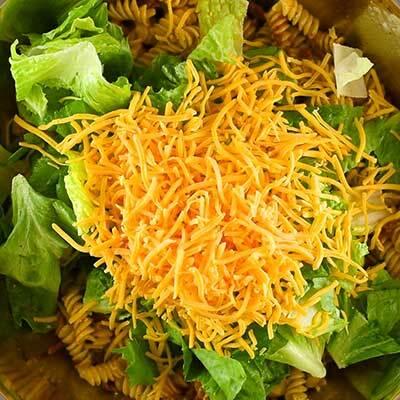 Proper taco pasta salad has a slightly sweet taste, and that comes from the Catalina salad dressing. Like the taco seasoning, you can either use a storebought sauce or make your own. 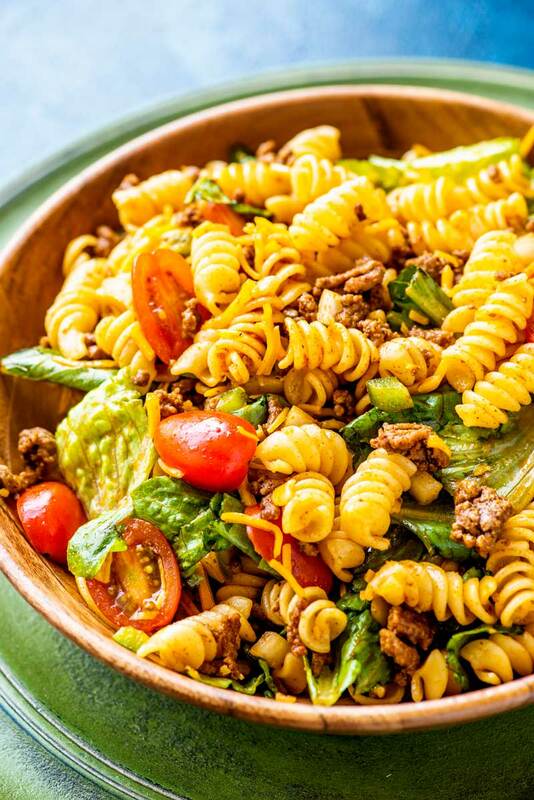 What can you serve with taco pasta salad? Step 1 – Cook pasta per package instructions. When finished, rinse pasta thoroughly with cool water to stop the cooking process. Drain pasta, place in a bowl, cover, then set aside. Step 2 – Cook and crumble ground beef until no longer pink, then drain any excess grease. Place in a bowl, cover, then set aside to cool. Step 3 – When ready to mix, add the cooked pasta, cooked ground beef in an extra large bowl. Add taco seasoning on top, then stir thoroughly. 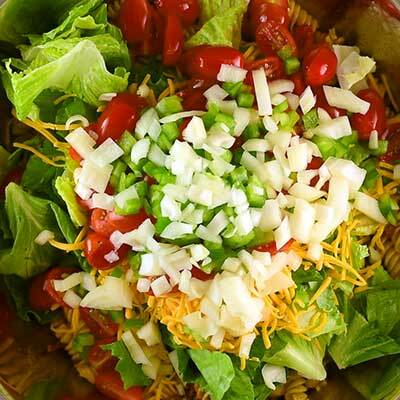 Step 4 – Add lettuce, cheddar cheese, tomatoes, green pepper, and onion to bowl. Drizzle Catalina sauce on top, then mix thoroughly. In a large saucepan, cook spiral pasta per package instructions. Drain pasta and rinse with cold water. Place pasta in a bowl, cover, and set aside. In a large skillet, cook and crumble ground beef over medium heat over medium heat until no longer pink. Drain grease, cover, then set aside to cool. In a large bowl, add cooked pasta and ground beef. 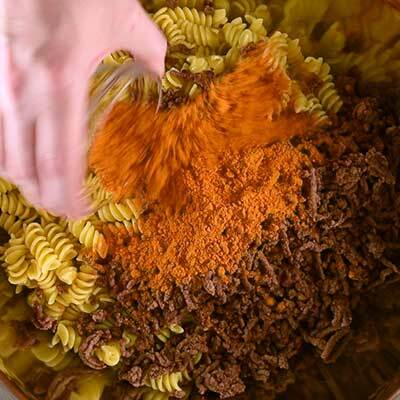 Sprinkle taco seasoning on top, then mix thoroughly to coat pasta and beef. 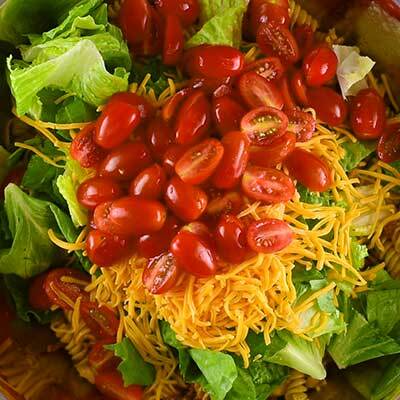 Add lettuce, cherry tomatoes, cheddar cheese, onion, and green pepper to bowl with pasta mixture. 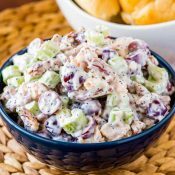 Drizzle Catalina dressing on top, then mix thoroughly. Serve taco salad immediately. 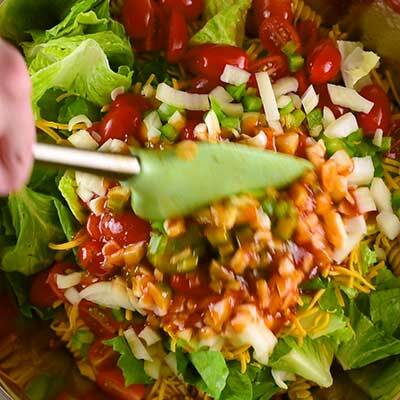 Taco salad can be stored in a sealed container in the refrigerator for up to 3-4 days. Recipe lightly adapted from Taste of Home. What is Catalina sauce ?? Print button doesn’t work on PC computer. Can’t wait to try this. Looks great!! I made this recipe tonight. It was good. Definitely a party salad. It makes a lot. This was just ok, much better the next day BUT then the tomatoes and salad aren’t fresh anymore.